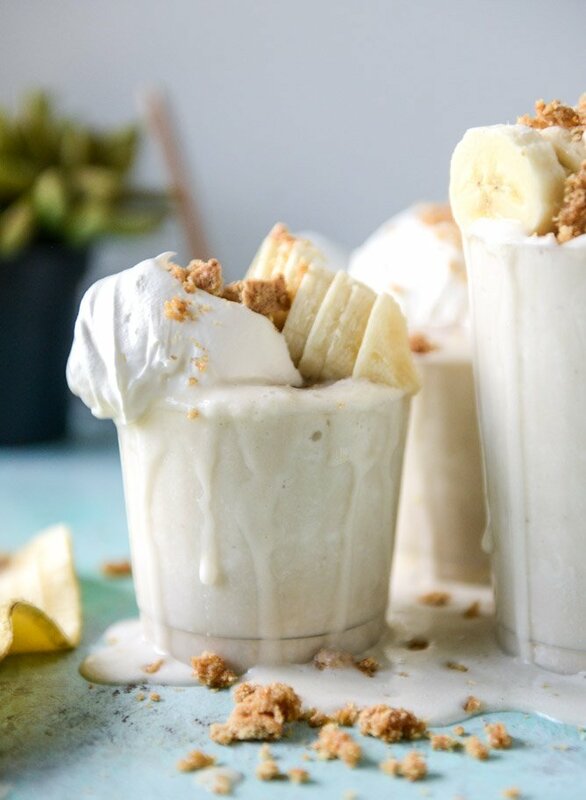 It’s like… banana cream pie in a drinkable form. Well, err. How about we go with “not terrible for you.” Just so the health police don’t come arrest me and all that. So many of my favorite things are inside of this frosty cup! I want it to be my afternoon snack until September. When I’ll change to apple cider sangria or something. I know bananas are a love it or hate it fruit, but I love them. Eddie likes them, but only if they are green or frozen in a smoothie. He DOESN’T like them with peanut butter or almond butter or some sort of nut butter which is, like, the way I eat mine 89% of the time. But we have a new banana lover in the house! Mr. Max. They are by far his favorite food right now – that title used to belong to cara cara oranges but once those went out of season, he became a banana fanatic. And I’m loving it, but if I’m being honest? I really just love how he nonstop asks for a “nana.” It’s pretty much the cutest thing I’ve ever witnessed in my entire life. I walk around the house shouting NANA all the time. It’s not annoying at all. I’m sure. This is kind of a spin-off of the old school banana ice cream in the food processor (which we still really LOVE! ), but in drink-and-spoon format. And it’s made with coconut cream! And some vanilla. And whipped coconut cream on top. And graham crackers! And emotions. But not sugary chocolate ones or salt and vinegar potato chip ones. And. It’s accidentally vegan, apparently. If you use vegan graham crackers. Winnnnnnning. P.S. I know those of you that are fah-reaking out over this mess. I know you! I got you. It’s clean now. Don’t worry. I’m thinking you could just go ahead and add peanut butter too – if you’re a peanut butter lovah. Why not make things less difficult and just put them spoonful in the blender? And then while you’re at it, add some bacon crumbles and we can call the whole mess an Elvis shake or something. I’ll do anything to mix bacon, peanut butter and banana and throw the Elvis name around. Chocolate drizzle too please! Oddly enough, I think Max would rather eat his banana slices in real form than have them pureed in a milkshake-like snack, but it’s cool. I’m teaching him the ways. Add the frozen bananas, coconut milk and vanilla extract to a blender and blend until pureed and thick and creamy. Add some sliced bananas to the bottom of each glass. Pour the mixture into glasses and top with the coconut cream and graham cracker crumbs. Add the extra sliced bananas on top! Mix the graham crumbs and coconut oil until the crumbs are moistened and piece-like. Stir in the salt. Set aside. Take the can of coconut milk out of the fridge. Open the can and discard the liquid (save it for a smoothie! ), then scoop the firm coconut meat into the bowl of your electric mixer. Beat on medium-high speed until completely whipped and thick. Beat in the extract if you’re using it. Set the bowl in the fridge until ready to use. Coconut cream is my love language. Omg, YUM! Haha, if Mr. Max’s “nana” love is anything like my 18 month old nephew than I completely understand how it’s the cutest thing in the world. I’m also a more grown-up banana fanatic so I’m totally digging this frozen amazingness. p.s. That mess just made me want one of these even more! my son’s first word was banana! he used to say na na na all the time when he was little. so cute! OH MY GAAAAAAAAAHD. I want this for breakfast right now. Coconut cream is the BEST. If you have Peet’s Coffee there I highly recommend the Coconut Cream Iced Latte (Half the coconut syrup). omg that sounds SO good. oh no! you can totally just use regular milk – or even half milk, half cream? Oh yum!! Something to do with all the frozen bananas in my freezer, besides sacrificing them to smoothies! that was my idea too! A total creamy banana dream! These look SO good! ohmygoodness!!! This, right here, is AMAZING! I really, really feel like we need to be friends for a number of reasons, but especially when I see you putting coconut cream on/in everything! Like, oh my gosh, you get me. I am pretty sure my Trader Joe’s is selling 90% of their coconut cream to me this Summer. It’s just the best! I love your site. The end. i almost buy out the shelf at TJs too! WORD. Every time I use my old blender and it gets stuck / doesn’t whip things up quickly, I vow to go buy a Vitamix. Then i’m in the store and running away before I actually drop $400 on a freaking blender!!! ugh i understand your pain! i was that same way for soooooo long!! then i was SO glad that i did it. YES! how funny. My husband was bugging me last night about all of the frozen bananas taking up space in our freezer (they’ve been in there for at least a month now…oops). I was on a major banana “ice cream” kick but got so sick of it. I think these milkshakes (at least that’s what I’m calling them) will be the perfect next step!! These look amazing! I’m a banana lover, and I love frozen bananas even more. Give me something like ice cream (but healthy! ), and I’m oh so in. Totally on my to-try list! Can’t wait to try this; I have a bunch of frozen bananas in the freezer and it’s too hot to make banana bread! LOL. I like this idea. I’ll have to try it. Thanks for sharing Jessica! haha good point! i don’t want to turn on the oven either. All I want to do lately is drink sweet things. Forget food, I want strawberry milk, chocolate milk, malts, milkshakes…and now this. Thanks for this recipe. I will definitely be making it! OMG that looks incredibly delicious! Will definitely make this as soon as I get back from Korea! hey girl this looks so tasty! Yummy! My daughter will love these, ty for sharing! My sister is gonna love these, thanks ! These look amazing!!! I can’t wait to give some great summer recipes a go!!! I love bananas and often free them for smoothies, so this frozen banana recipe drew my attention. Looks yummy ‘licious! The photos make it look like a sticky mess. Wish food photos wouldn’t overfill bowls, pots, pans and glasses. So unappetizing and makes the whole dish look like one big mess! This is delicious! I kept it real simple and skipped the Graham cracker, whipped coconut cream, and sliced bananas on top. Ummm, YUMMM! This was absolutely delicious. My new favorite sweet treat. Thanks for the recipe! Thanks for the awesome vegan recipe ! We buy about 5 bunches of bananas each week, but they don’t even last 2 days because we freeze them and turn them into ice cream! Mangoes, jackfruit, durian, and caramel are also good ice cream combos for using just banana!